How do you get started with OKRs? Used by the likes of Google, Linkedin, Intel, Zynga, Oracle, Twitter, and Sears, OKRs are a common management strategy in the modern working world. This introduction to OKR with infographics helps you join the ranks of companies that have nearly perfected the art of the new world of management. Through aligning and visibility, OKRs help you to unite teams and entire organizations together. 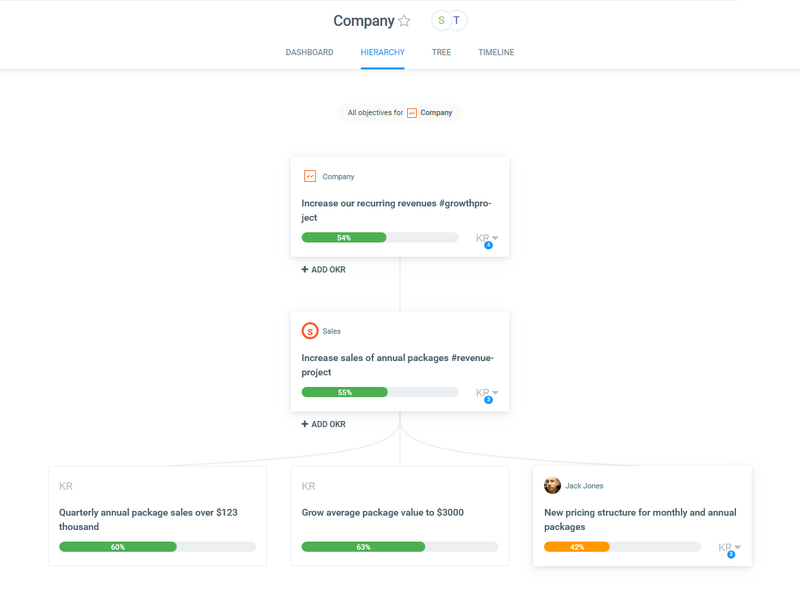 So, basically, OKR helps you set company, department, team, and personal goals. You connect each goal with 3-5 measurable results. As you achieve those results, the percentage of the entire Objective increases, so you can see the progress towards your aspirational goals. 'Focus' is the most important step. You should only have 3-5 Objectives. Therefore, OKRs help you figure out what's most important (priority items) and how work at every level connects to your most important goals. There's a bunch of good examples of OKRs at okrexamples.co to help you get a grip on how that works. So, what about John Doerr? Doerr was given an introduction to OKR while he worked at Intel. When Google was still a tiny start-up, he introduced OKRs to its founders. Nowadays, SME's to Fortune 500 use OKRs. So many successful organizations use OKRs now. But there's a reason why there's so much success. Once you get into the swing of things and change your workplace culture to allow OKRs to thrive (easier said than done, I know), OKRs are an efficient way to track company and team goals and measure their progress. They help your organization's success by cutting out unimportant goals and focusing on what truly is important within your organization. So, why not try it out with your team? Starting with OKRs takes between 1-3 quarters! What's common in Google, Linkedin and Zynga? All use OKR – Objectives and Key Results. See how. 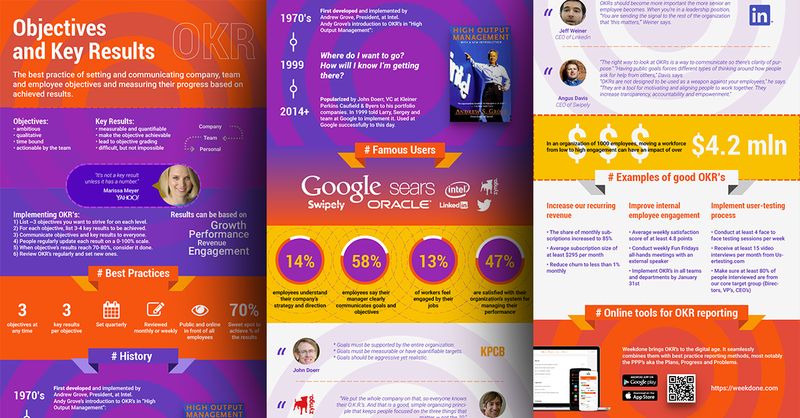 The infographic below helps you with the whole story of OKRs, their history, best practices, and case studies about real users. Want to learn more? Learn how to set OKRs in 5 steps or read the "Step by Step Guide to OKRs" free e-book. There's also the "Employee Guide to Getting Started with OKRs" if you are viewing OKRs from the team member side. Sample OKR templates, examples, helpful links, and videos on the OKR Resources site are available. For a big collection of OKR examples, see okrexamples.co. When you're ready, experience is the best way to learn OKRs. 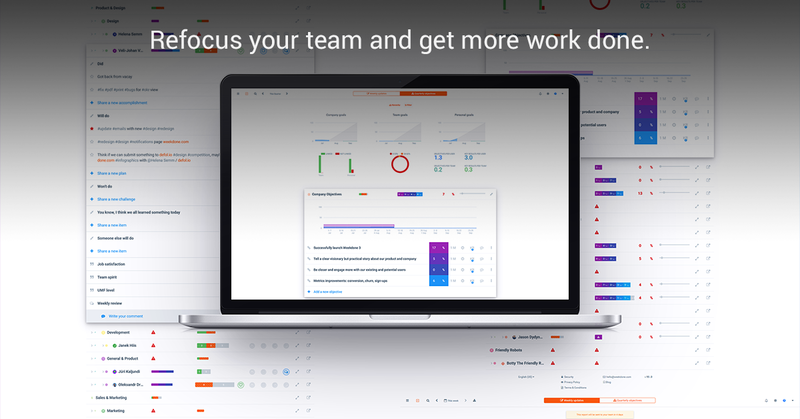 Try them out for free in the Weekdone OKR software. <a href="https://blog.weekdone.com/introduction-okr-objectives-key-results/"><img src="https://blog.weekdone.com/wp-content/uploads/2014/07/OKR-infographic.png" alt="Introduction to OKR – Objectives and Key Results" style="border:0;width:100%;max-width:800px" /></a><br>Infographic created by folks at Weekdone, the <a href="https://weekdone.com/">better team management tools company</a>. If you are just starting out with OKRs (Objectives and Key Results) some problems and mistakes are likely to happen. OKRs require you to make a cultural change, and change itself is difficult. You can expect to get the hang of OKRs only after about 2-3 quarters. But for now, knowing what not to do can help you on your OKR adventure journey. Here are five common mistakes people make while starting out. 1. Your objectives are too challenging or not challenging enough. You may think that your team completing 100% of their goals is great! However, you may be setting goals that are too easy. Objectives should be ambitious, but not too difficult. You should expect to achieve about 70-80% of an Objective in a given quarter. Anymore or any less and you may want to reevaluate your OKRs. You and your teams should update the progress of your key results regularly. OKRs should be discussed every week. Create a weekly ritual around OKRs to review them with your team. Otherwise, at the end of the quarter, you may find that you are way off track! Too many objectives or key results can take away the focus on what your priorities are. Teams should have maximum of 3 Objectives per quarter with up to 3-5 key results per objective. That way, the amount of work will be much more manageable and far less confusing. Key results should be numeric. They are what makes your Objective measurable. It's important to remember Objectives are your big, ambitious goals, Key Results measure the achievement of an objective, and Weekly Plans are the daily tasks and initiatives you do to reach your goals. This problem comes when personal objectives are not written to support team and company goals and vice versa. Management should be communicating with team leads the role they play in the bigger picture, and employees should understand how their activities help achieve team goals as well. Make sure to have a meeting when OKRs are created so you can move everyone in a unified direction. OKRs take some time to implement and you can expect a few bumps along the road. That being said, using an online tool like Weekdone can make starting the process all the more easier. Training yourself in the proper methodology to set OKRs will increase your chance of being successful with them. The easiest introduction to OKR for your team is to sign up for a trial of the Weekdone OKR Software. Give it a go – it's free to try. Remember to follow us on Twitter, Google+ and Facebook for all about employee engagement, okr, objectives and key results and more!